Last week was the first week of a fun class I decided to join. It's called Love Where You Live by Little Paper Products. (Sign up, it's not too late. Tell them Holly Genc sent you in the comments to enter for a chance to win a free class. This is an affiliate link.) The founders are two of my favorite Project Lifers to follow. The first week was all about capturing those messes in your home creating by living! With 3 littles running around, I have plenty of those! 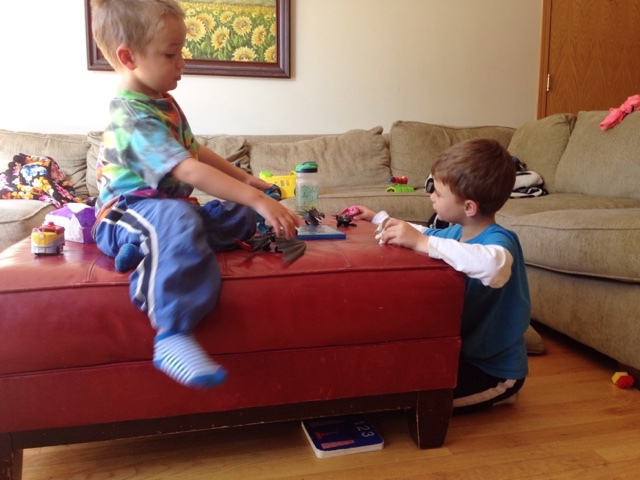 My preschooler with his best buddy over for the afternoon (his mom and I routinely swap play dates where one of us picks them both up from morning preschool and keeps them for the afternoon). These two are into dragons and dinosaurs! They are usually all over the place. TOYS EVERYWHERE! I can't believe that I'm showing you this. My junk drawer! And it's a huge one! I bought up a bunch of those Antonius drawer dividers from IKEA because they are perfect for storing pocket page cards. I might have over bought. So, some reside in my kitchen drawers, too. It doesn't seem to currently be helping my junk drawer, though. 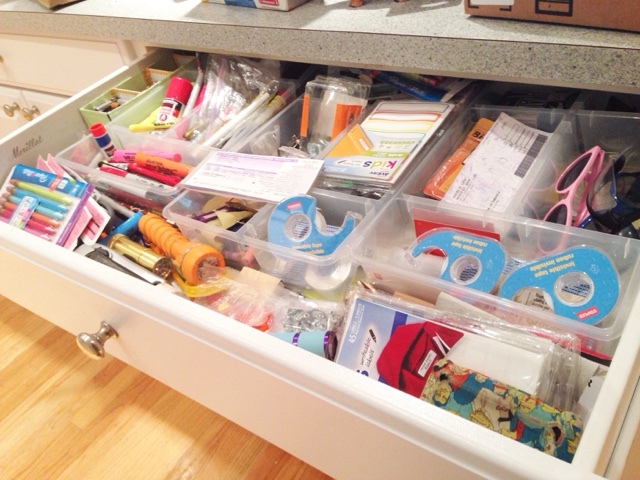 So, this drawer is on my never ending To-Do-List! 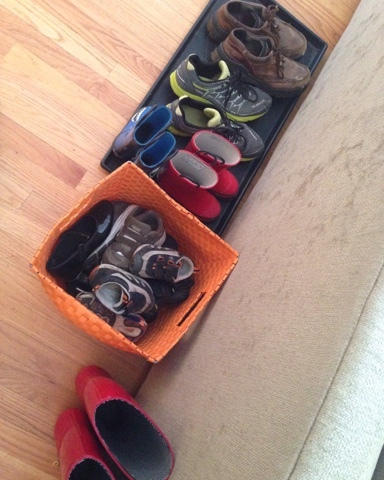 Our big pile of shoes that collect by the front door. There are five of us living here. And we are urban, which means we walk around our city a lot. 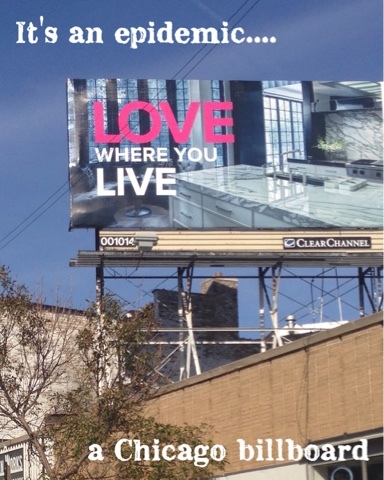 We are in Chicago, which means the weather changes daily. All this equates to lots of different types of shoes. I might need a new system...To-Do-List! 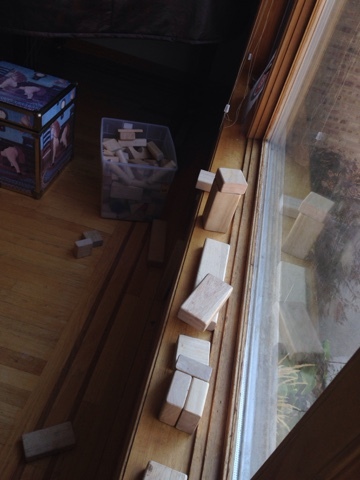 My new thing is to try to keep a lot of the toys downstairs, but these blocks stay in our main living room space. And they like to build right on the picture window sill. And boy that window gets lots of fingerprints! My ugly, comfy old lazy boy. I wish I had a photo of a beautiful, colorful, calming reading nook, but I don't (yet). This old lazy boy was bought through craigslist when I needed a low-to-the-ground rocker/recliner that was small enough to fit in my bedroom after giving birth to my third c-section baby. I swore I'd get rid of this eye-sore after I was done "needjng" it. Well, my youngest is 2.5 and it's still here. I've tried selling it/practically giving it away and it didn't work. 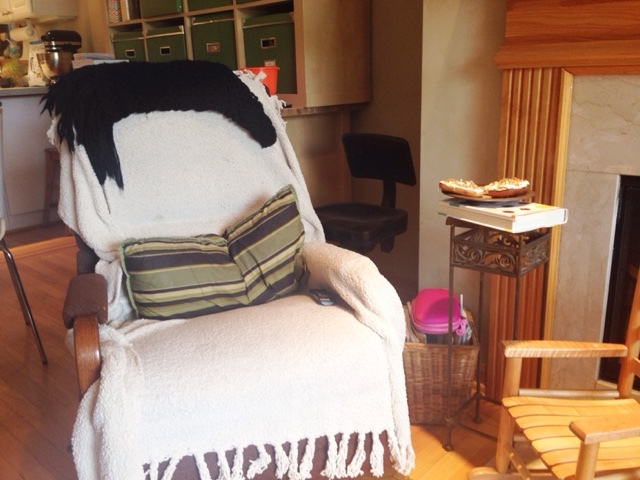 I tend to eat a light lunch at this chair, while reading during nap time. I think I'd miss it. It needs a facelift....To-Do-List! And this one really talks about my life with a 2-year-old right now. It's always my fault, really. In this case, I left the box of cereal outside of the LOCKED cabinet it usual is stored in. I was trying to swap out summer and fall clothes in the kids' room, when I heard some rustling that I knew couldn't be good. 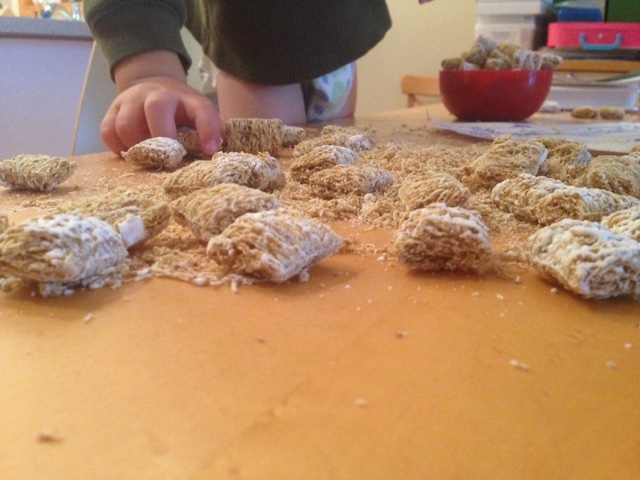 I come around the corner, and he had dumped the entire box of mini-wheats on the table!!! Usual, I'm immediately having him help me clean it up, but today I stopped and took some pictures. Can't wait to put this together on some pocketpages! I'll be back to share.